Why Buran Ghati Trek is difficult to set up in post monsoon season? Organizing a Himalayan trek in less popular routes is not an easy affair. You have to work with your resources and collaborate with local men of the region. Ensuring conformity of service that aligns with utmost care for nature and it’s people is critical. This is every Trek Organizer’s mountain problem to solve. Buran Ghati (also known as Barua Pass) in Himachal Pradesh posed a similar challenge. Nestled at the higher region where the Pabbar river originates, the Buran Valley was high in my exploration list. After I separated from Indiahikes this October, I decided to head to Buran Ghati and explore its trekking potential. I arrived at my hometown Shimla and met a few of my acquaintances. A plan materialized with few young blokes. A list of supplies needed for the trek was prepared with great enthusiasm. Everything seemed to be in place. We had confirmed local porters from Chirgaon. A reliable Jeep was at our service for a drop to Janglik, the base camp of the trek. And then, disaster struck. The negotiation with local sirdar fell off. The assured gas cylinder became a herculean effort to arrange. With just a day left for the trek our plan fell apart. In hindsight, we were wrong to plan Buran Ghati in post monsoon months. There are lessons that were learned. 1. Shortage of support staff is the biggest problem of this region. The district of Shimla and Rohru is predominately an apple belt region. The harvesting season of apples begins in the month of August and September. There is a huge shortage of labor. During the autumn months, the workers here command a hefty wage. Even if you find men to work as porters, there is no assurance they will show up for work. This makes running treks to Buran Valley very difficult for any trek Organizer. 2. Reaching Janglik the base camp of the trek is a harrowing experience. During post monsoon season, the roads are in shabby conditions. Battered by constant rain and a heavy influx of trucks offloading apples, it is not an enjoyable journey. 3. The local jeep operators charge exuberant amount of money for a drop from Rohru till Janglik as a private hire. Trekkers have an option of taking a shared jeep from Rohru till Chirgaon. One has to then wait for next availability of a shared jeep for a drop till Tonglu or Damvari village. The wait sometimes can be frustratingly long. Be prepared to sweat it out to get a seat. From Tonglu, one has to walk an hour on dirt road to read Janglik. No shared jeep goes till Janglik. This makes ferrying supplies and trekking equipment to Janglik a difficult and costly proposition. Doing Buran Ghati in post monsoon month is a challenge for any Trek Organizer. Without local support staff, it is better to look elsewhere. I would advise trekkers to come here in the month of late May and June, the best time to trek. I am planning solo Buran Ghati trek for June 3rd week. Kindly let me know is it good time for this thek. Also is there any villages on the way where I can refill my resources. Atanu your dates look fine to me. Do carry a rope, ice axe that you will need on the pass crossing day. I would advice to pick up your supplies from Rohru if not Shimla. After that getting all the supplies is not guaranteed. can you find me a link who would take us to Buran Ghanti trek in late December? Importantly, is it doable in December fall? Avoid Buran Ghati in late December. Weather and altitude not suited for camping. Getting supplies and porters in winter will be very difficult even for a trek organizer. No one in sound mind want to trek Buran Ghati in late december. Can we do buran ghati trek in may? Also how much will the local guide charge? You may attempt pass crossing in last week of May on forth. Rates of guides are around 800 to 1200 INR subject to negotiation. I have done 6 Easy-moderate treks (total comes 100+ kms) before. Can buran ghati be done without trekking company or a guide..? If you have experience of doing a high altitude pass crossing trek then you can go for it. Something like a Rupin Pass trek. how about in last week of June? will there be enough snow ? Yes,you should find snow on the pass crossing day. We are planning to do buran ghati trek in mid October this year … Can you please tell me how will be the conditions over there at that time … Shall we face the challenges that you’ve explained above ? Do it not later than 1st week of October. You may find travelling difficult but things are better than before thanks to influx of many trekking companies operating on the route. 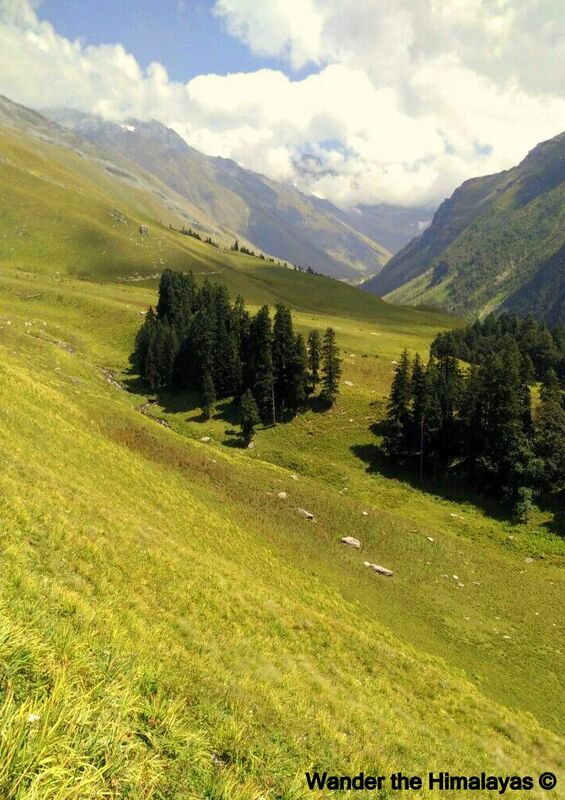 I’m planning to do buran ghati trek in sep last week, do i find snow? how will be the weather, will it still raining? cold ?